Casa Camelia - VTAR/GR/01353 - 2 Bedrooms/Sleeps 3 - Shared Pool. Property 8: Casa Camelia - VTAR/GR/01353 - 2 Bedrooms/Sleeps 3 - Shared Pool. CASA JAZMIN (VTAR/GR/01353) - Private pool, sleeps four, amazing views. Property 10: CASA JAZMIN (VTAR/GR/01353) - Private pool, sleeps four, amazing views. A beautiful country house in lovely gardens with 360 degree mountain views. Property 15: A beautiful country house in lovely gardens with 360 degree mountain views. Recently renovated 2 bed townhouse with a large roof terrace in Orgiva town. Property 18: Recently renovated 2 bed townhouse with a large roof terrace in Orgiva town. Property 21: Alpujarras. 500 Year Old Stone House In Whitewashed Hamlet. A Walkers’ Heaven! The Mill - a magical, secluded country house set in its own valley. Property 23: The Mill - a magical, secluded country house set in its own valley. HOUSE AURORA. House with pool in Lecrin Valley, between Granada and the beach. Property 39: HOUSE AURORA. House with pool in Lecrin Valley, between Granada and the beach. Los Barranquillos Rural Cottage. 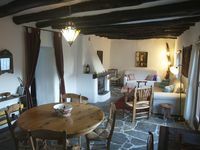 Your ideal house in Lanjarón to know Alpujarra. Property 44: Los Barranquillos Rural Cottage. Your ideal house in Lanjarón to know Alpujarra. Quiet and comfortable villagehouse,private garden with heatable pool,garage. Property 45: Quiet and comfortable villagehouse,private garden with heatable pool,garage. Casa Josefa is a very special small home. It has been recently renovated with fresh paint, windows, doors, appliances and fixtures. The slate floors are beautiful. Furnishings are a mixture of nice antiques and basic new. Kitchen was well stocked and the bed was comfortable. It's very cosy with great views. The bedrooms are nicely heated but the rest of the home relies on two wood stoves which are a fair bit of work if it's chilly out. The house was unheated when we arrived and took several hours to get comfortable. Wood costs 8 euros per bag and we used two per day to stay warm with temps ranging from 5-10 C. If you don't mind the work and expense it can add to the ambiance but may not be for everyone in the cool season. The owner could not have been nicer. She was accessible and very helpful. Really the complete package. Highly recommended overall.